I published the above report some ten days ago, actually on the 20th of January 2015. I want to copy it here again and stress some of what it says. “A new report by Public Services International (PSI) warns that governments are planning to take the world on a liberalisation spree on a scale never seen before. According to the report, this massive trade deal will put public healthcare, broadcasting, water, transport and other services at risk. The proposed deal could make it impossible for future governments to restore public services to public control, even in cases where private service delivery has failed. It would also restrict a government’s ability to regulate key sectors including financial, energy, telecommunications and cross-border data flows. I ask myself why do I bother reading such stuff? I am just one of the masses. I have no special education, I cannot compete with the power of governments or multinational corporations or any of the very rich people. I am very near the end of my life. Why is it not enough for me to just concentrate on having as good a life as possible for the last days of my existence here on earth? 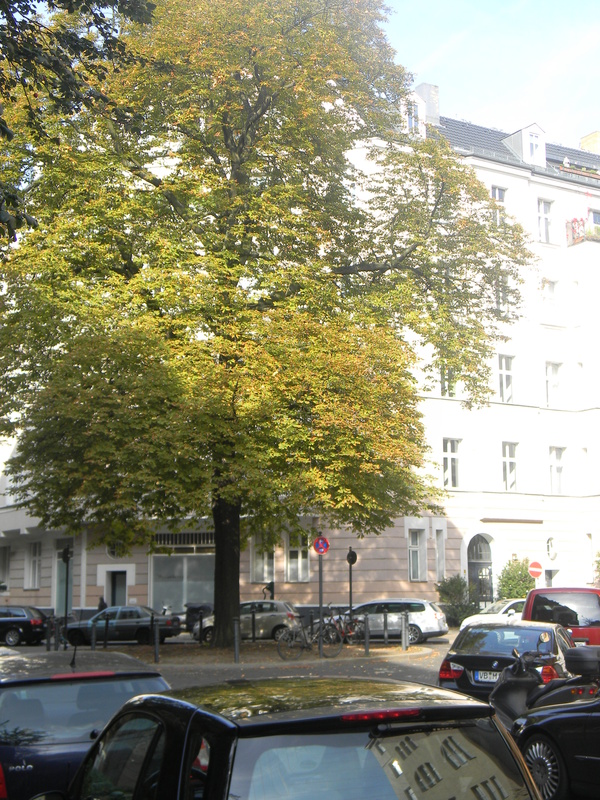 This is a view of Bozener Strasse towards the Chestnut Tree. 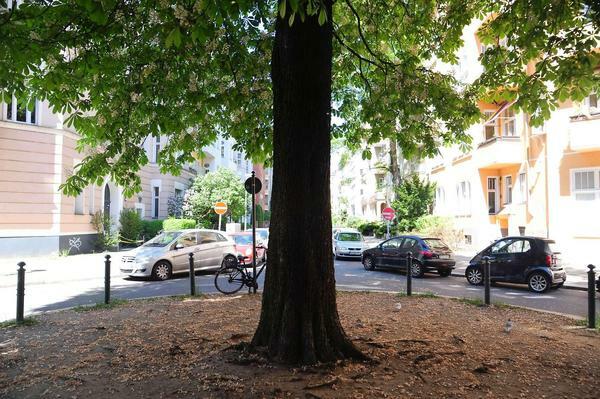 This picture is to be found in this article by the Tagesspiegel about Bayerisches Viertel. Here is another picture of that Chestnut Tree. 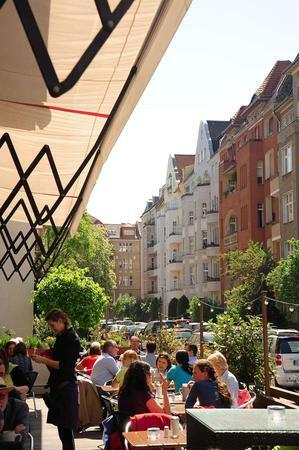 This is a picture of Bozener Strasse seen from the “Robbengatter” Restaurant. 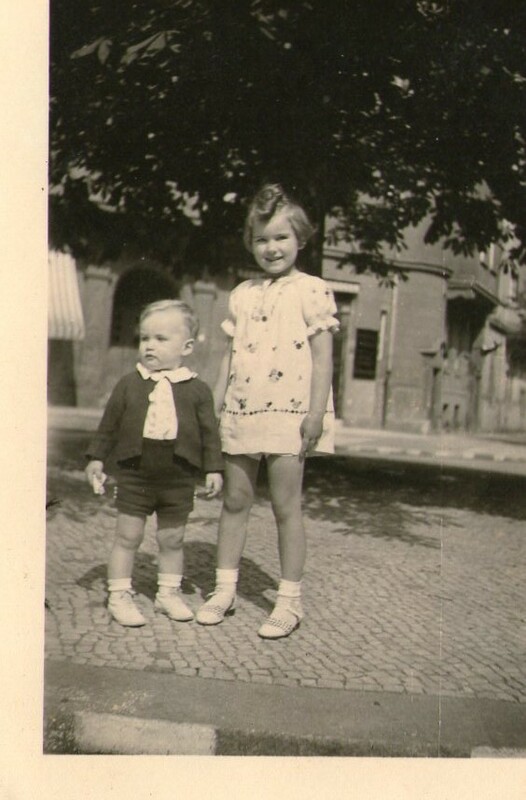 This picture under the chestnut tree was taken on the 9th June 1940, my brother Bodo’s second birthday. 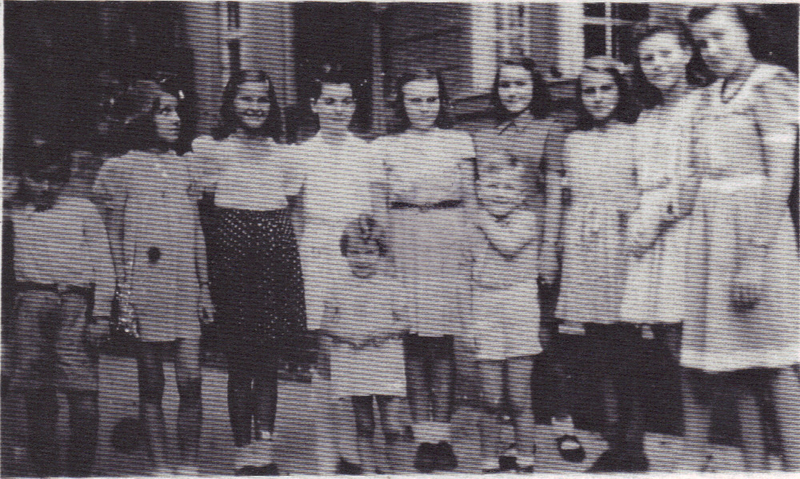 9th June 1940: All the party guests are under the chestnut tree for picture taking. 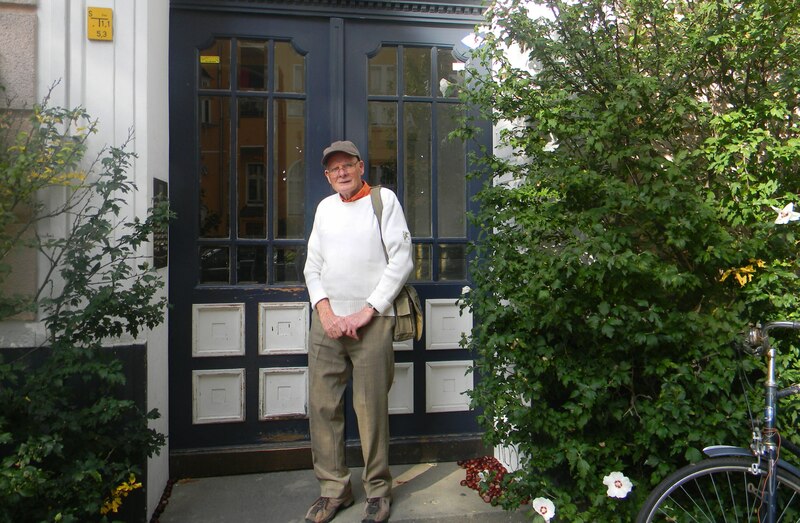 Peter in Bozener Strasse, the street where I grew up! The other day I could not copy the pictures to this blog. I have no idea what went wrong that day. Today I tried it again, and it worked immediately! So I publish here once again the whole blog. I guess some bloggers who have already been reading this blog might like to see the pictures that go with it. I did write this blog in 2013. Mum must have seen their apartment once for I remember her remarking how sparsely furnished it was. Mum found their choice of furniture quite odd. There were a great number of shelves stacked full with books. These shelves went from floor to ceiling. Herr Lepsius sometimes showed us children books with colourful illustrations. He also told us stories. We loved one story in particular which had a funny ending. We demanded to be told that story again and again. Each time we laughed our heads off and Herr L laughed with us. The story was about a beggar who knocked at the door of an apartment. A ily had two connecting apartments across two buildings; that is, the wall between the buildings had beautiful maid opened the door. Some time later the beggar knocked at another door of an apartment in the neighbouring building. And the same beautiful maid opened the door! We found the astonishment of the beggar very funny! Herr L explained to us, that a wall had been broken through to connect the apartments on that floor. This was actually where the family of Herr L had lived, when he was a boy. I was born on the 21st of September 1934. This was when we lived in Taunus Strasse, Berlin- Friedenau. Some time during 1937 we moved to Bozener Strasse in Berlin-Schöneberg. This is where Tante Ilse and Onkel Addi lived as well and also my friend Cordula Lepsius and her parents. 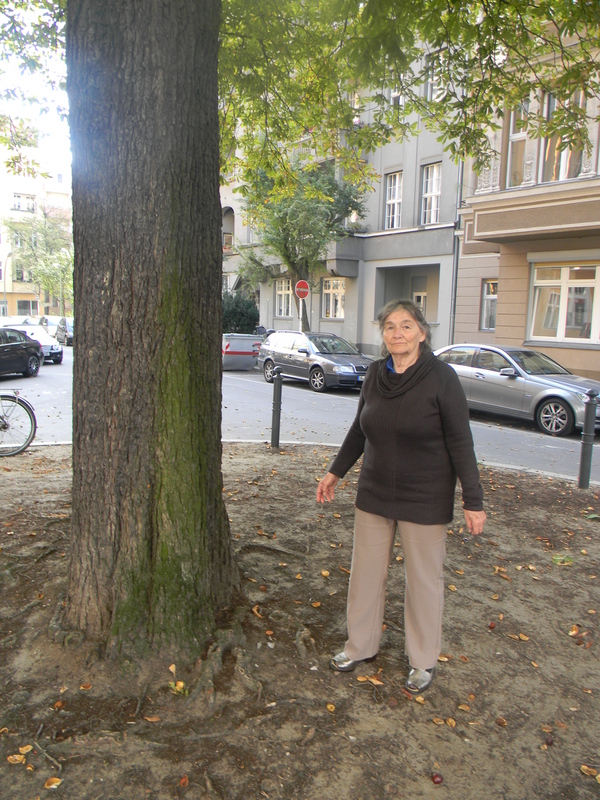 Later on we did get to know Family Todtenhausen who lived in the house opposite our apartment building. 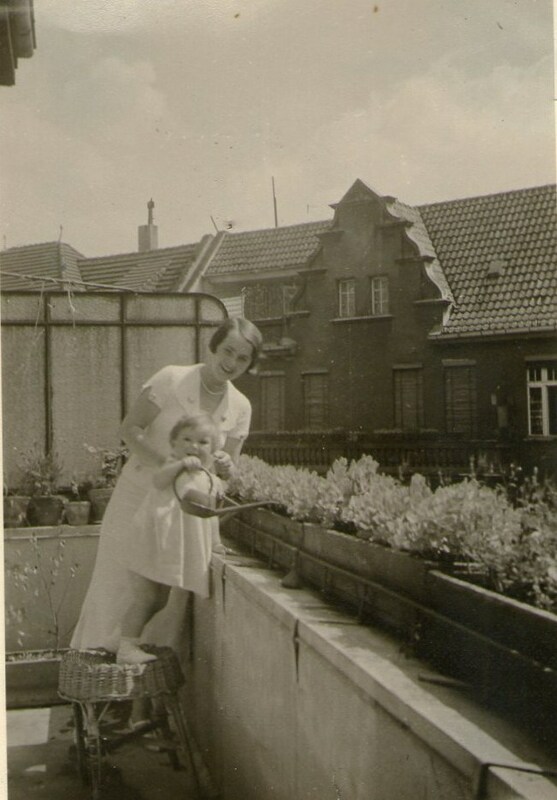 We lived on the second floor, Tante Ilse lived two floors further up. Mum quite often went up with me to visit Tante Ilse. One of my early memories is that Tante Ilse and Mum were lying under the bright lights of some tanning lamps (Höhensonne). They used some oil on their skin which smelled beautiful and made their skin look shiny. Their skin had usually a bit of a tan. They wore some protective dark glasses. Sometimes they made me lie under the lamp for a little while. I liked it when some of this nice smelling oil was rubbed all over my body. I too had to wear these dark glasses. I liked to wear them for a little while. But I was required to lie totally still. Very soon I did get sick of it, not wanting to lie still any more under the hot tanning lamp. I was then always glad when I was allowed to get up again. I remember thinking that Auntie was a very beautiful looking woman with her very long curly hair. I remember watching In the three way mirrors of her dressing table how Auntie brushed her hair. It was very strong and long chestnut-coloured hair. Auntie usually brushed it slightly back so it stayed behind her ears. She often wore very long blue earrings. Oh, I loved the look of these blue earrings! They looked so beautiful hanging down from Auntie’s ears. I think Mum did not wear any earrings, because her ears were covered by her hair. Mum’s brown hair was very fine and much shorter than Auntie’s. My hair was rather fine too. Mum always cut it quite short. I often wished that I could wear my hair longer but Mum would not let me grow it longer. Later on both Auntie Ilse as well as Mum wore identical three big rolls of hair horizontally on top of their heads. The front rolls covered the top of their foreheads, the other two rolls were rolled behind the front roll. They also often wore identical clothes, for instance light pink angora wool tops with identical grey suits. My brother Bodo was born in 1938. I think Cordula’s brother Tilwin was born one year later. Mum said that Tilwin was an extremely odd name. And on top of it he grew up with very bright red hair. The children in the street teased him about his hair. As much as possible Cordula always stood up for her brother. I think for the most part Tilwin avoided playing with other children. We lived on the third floor. The Lepsius apartment was on the same side as our apartment, just two floors further up. (Auntie Ilse’s apartment was on the other side of the fifth floor). I often went up to the Lepsius apartment by myself to play with Cordula. They had a ‘roof-garden’ (Dachgarten) above their apartment. It was the size of a big room and had no roof above it. I remember the sun shining right into it. The floor was concrete, and along the walls were garden-beds . Cordula was allowed to look after her own little garden-bed.. Once Cordula’s Mum let me have a portion of a little garden-bed too! Cordula’s Mum and Dad were always kind to me. They made me feel welcome and included. Cordula’s family had food that I had never seen before. For snacks we children were often given some kind of brown flakes and raisins. Sometimes we were given dates or figs. I loved this food! My Mum thought it was strange to eat something like that. In Mum’s opinion this family was rather odd because they had lived in the Middle East for a while. Cordula’s father was an architect. My Mum called him ‘the Hunger-Architect’ (Hungerleider) since he seemed to get hardly any work in his profession. Mum must have seen their apartment once for I remember her remarking how sparsely furnished it was. Mum found their choice of furniture quite odd. There were a great number of shelves stacked full with books. These shelves went from floor to ceiling. Herr Lepsius sometimes showed us children books with colourful illustrations. He also told us stories. We loved one story in particular which had a funny ending. We demanded to be told that story again and again. Each time we laughed our heads off, and Herr Lepsius laughed with us. The story was about a beggar who knocked at the door of an apartment. A beautiful maid opened the door. Some time later the beggar knocked at another door of an apartment in the neighbouring building. And the same beautiful maid opened the door! We found the astonishment of the beggar very funny! 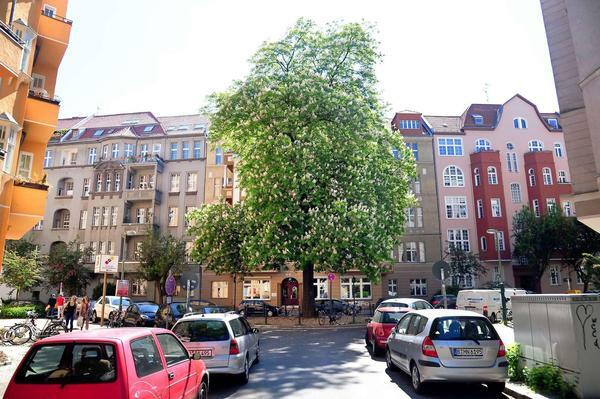 Herr Lepsius explained to us, that the family had two connecting apartments across two buildings; that is, the wall between the buildings had been broken through to connect the apartments on that floor. This was actually where the family of Herr Lepsius had lived, when he was a boy. Herr Lepsius was old and bald. I believe he was about twenty years older than his wife. Quite a few years later Cordula and I went to the same high-school. We walked there together every morning. One morning I climbed up the stairs to Cordula’s apartment to find out why she had not come down yet to go to school with me. I rang the bell. Frau Lepsius opened the door. She was in tears. She did not let me come in but went with me to the top of the stairs. She said: “Our father just died; I haven’t even told Cordula yet.” She looked at me with despair in her face. I did not know what to say. She hugged me and then she disappeared in her apartment. I mentioned in this post our landlord, Werner M. He is here in this picture which was taken by Mrs. T. on Christmas Eve 1943. 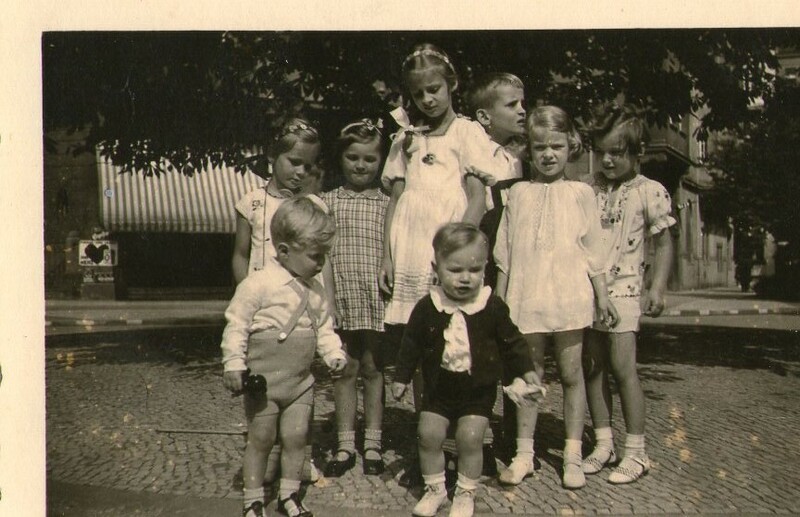 Werner M. is on the left, on the right is Mr. T.
Tante Ilse is next to Werner M. together with cousin Renate. I am in the back with my doll. 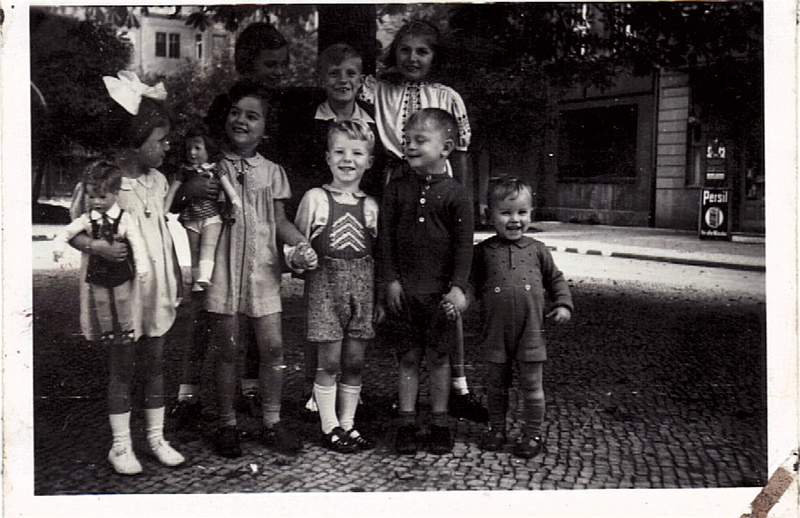 The children in front are Eva T. and my brother Bodo. 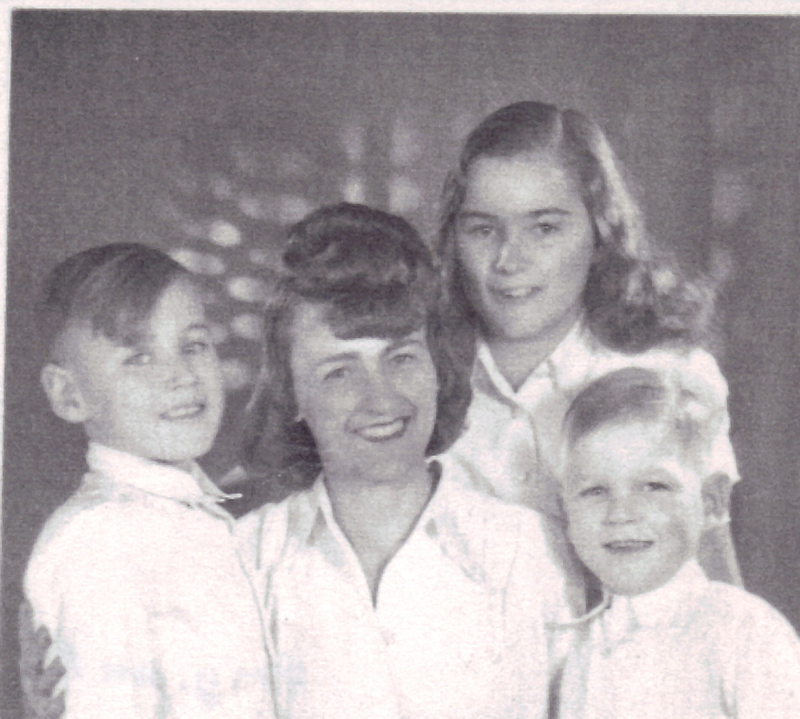 Next to Mr. T. is Mum and Grandma Olga (Mum’s mum) is on the left next to Werner M.
Peter and I eat a banana every day. 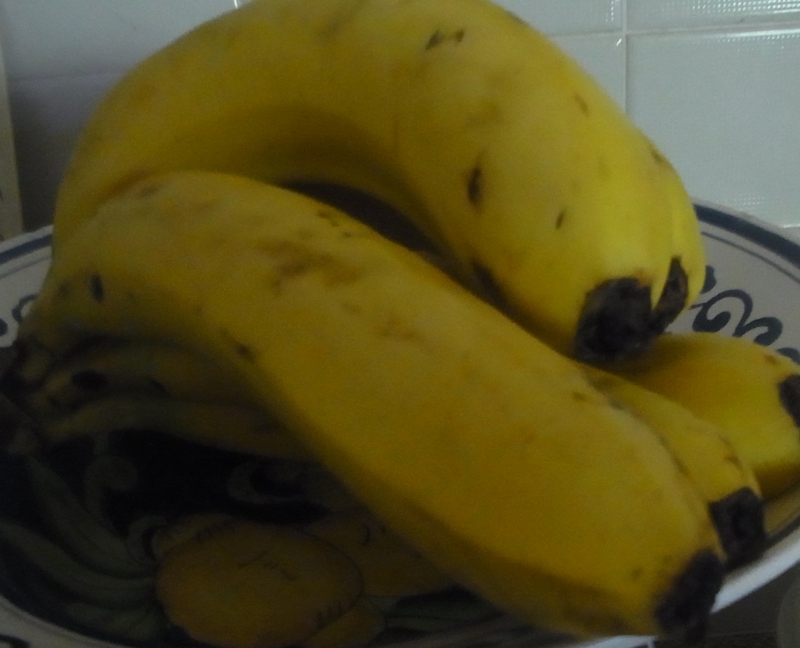 When they are as large as the ones in the picture, we share one banana. We also have a few cherries every morning. At the moment Australian grapes and peaches are in season and taste very good. I think we spend more money on fruit and vegetables than on meaty things. Today’s news is that next year one per cent of the global population are going to own as much as the rest of us together. I wonder how this shall go on!! I think it is fair to say that our civilisation is in crisis or very close to an immense crisis. I do not want to be ignorant about this, but I also do not want to give in to fear. Isn’t there always some light at the end of the tunnel? Today I reblogged quite a few blogs that were written by very knowledgeable people, mainly by Joseph E. Stiglitz, who comes across to me as an economist who knows what he is talking about in a global sense. The warning signs are clearly there for everyone to see. Maybe it is mostly people and organisations with too much power and also people who think they have too much to lose who want everything to just to continue on and on and on. Common sense would tell them it just cannot go on like this indefinitely. But who wants to let common sense rule their lives?! While researching TTIP on the net ( a former judge of the German Highcourt says TTIP is against international law) I discovered that there is something even more insidious in the offering: TiSA. It boils down to that the USA want to conquer the world without having to fire a shot. All negotiations are in secret and Australia is part of it.